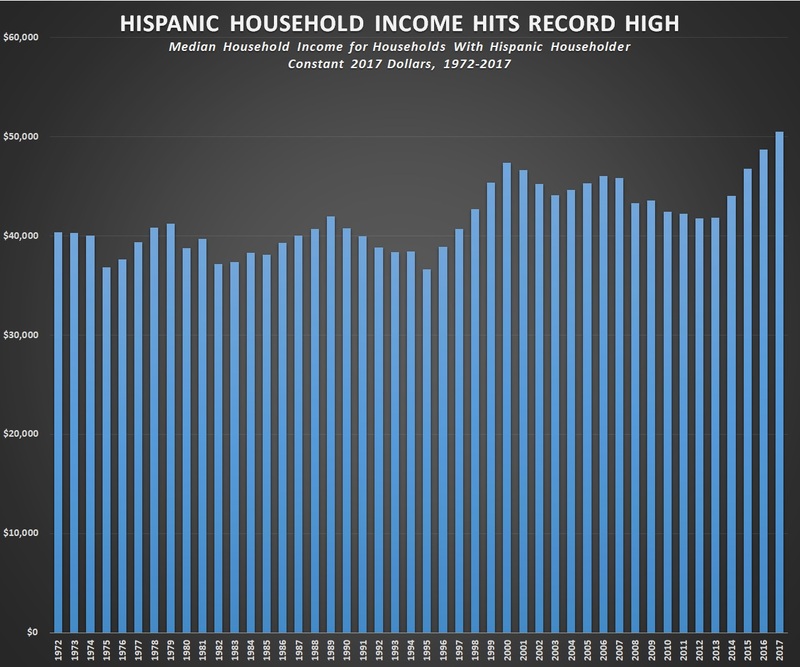 (CNSNews.com) - The median household income for U.S. households in which the householder is Hispanic hit a record high of $50,486 in 2017, according to the Census Bureau’s annual income report, which was released last week. “[W]e can confirm that real median household income was higher in 2017 than in any prior year for which we have data,” the Census Bureau told CNSNews.com in specific reference to Hispanic household income. The $50,486 Hispanic median household income in 2017 (as reported in Table A-1 of the Census Bureau report) was an increase of $1,786—or 3.7 percent--from the Hispanic median household income in 2016, which was $48,700 in constant 2017 dollars. In its report—“Income and Poverty in the United States: 2017”—the Census Bureau cautioned on making historical comparisons between the report’s overall median household income numbers for years before and after 2013 because of changes the Census Bureau made in its survey in 2014. “Although 2017 [overall] median household income appears to be the highest median household income ever reported from the CPS ASEC, comparisons to estimates prior to 2013 must be made with caution as the income questions were redesigned in the 2014 CPS ASEC (for income in 2013),” said the report. However, in response to an inquiry from CNSNews.com as to whether the Hispanic median household income for 2017 was in fact a record, the Census Bureau confirmed that it was. When the Census Bureau redesigned the survey in 2014, it ran what it called a “split panel” test to determine how the redesign impacted the numbers. In response to CNSNews.com’s inquiry as to whether Hispanic median household income had set a record in 2017, the Census Bureau confirmed that Hispanic income did not come out higher because of the redesign and that, therefore, the 2017 Hispanic median household income number was in fact a record.